My latest sculpture commission is finished. 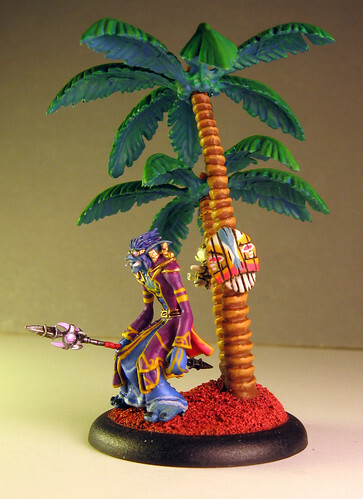 It's a 28mm scale miniature of an in-game avatar from World of Warcraft. I based it directly off of screen shots taken from the game. You can see the full set of photos here. 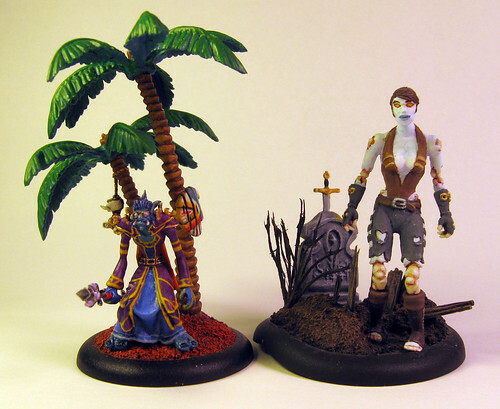 As in my previous undead sculpture, I wanted Agloc's base to shed some light on his character. 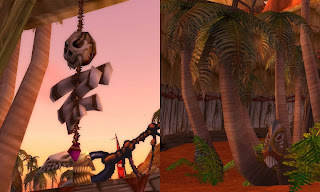 The red sand, palm trees, tiki mask and hanging bones are all elements from his home village in the game. 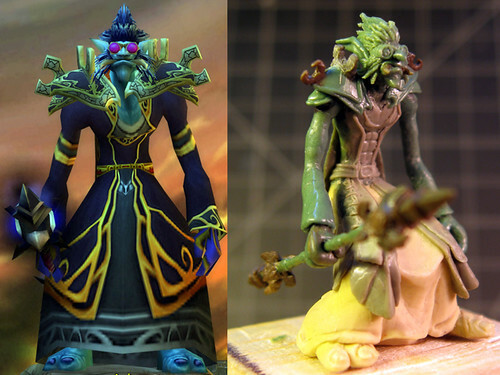 For those of you who have been following along, here is a side by side comparison of Agloc and my previous miniature WoW sculpture - Anathea. I thought that working on a smaller scale might take less time, but I was wrong. Sculpting Agloc was a lot of fun, but I'm glad to finally be finished. The list of things I want to sculpt has been growing rapidly, so now it's back to the drawing board to decide which one to do next. Awesome! He's so colorful, really bright and lovely. I didn't realize that he was Polynesian, so the base really does help. Congratulations on a big finish.